Charcoal grills are associated with higher emissions than gas grills. While tailgating this football season you may want to take a step back from the grill and generator — for your health. NC State researchers found that air pollution rises in tailgating lots before and after major football games most often due to large charcoal grills, old generators and idling vehicles. 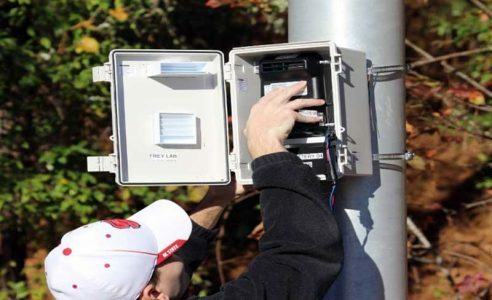 During the 2015 football season, College of Natural Resources assistant professor Kyle Bunds and associate professor Jonathan Casper teamed up with College of Engineering professor Chris Frey to monitor air quality in and around NC State’s Carter-Finley Stadium before, during and after all six home football games. “No one has looked at this issue of what kind of exposures you have in a tailgating situation, and it’s one where there could be high exposures,” said Frey, who has conducted years of air pollution research. Researchers strategically placed stationary air quality monitors in each of the major tailgating lots. With mobile and stationary air monitors, researchers gathered roughly 21,000 data points per game on temperature, relative humidity, ozone, carbon monoxide (CO), carbon dioxide (CO2) and PM2.5, which is fine particulate matter suspected of posing the greatest risk to human health. While the results indicated good air quality inside the stadium and during the game, overall air quality around the stadium worsened immediately after the game as thousands load into vehicles, which often idle in traffic leaving stadium parking lots. Even after traffic subsides, air monitors indicated that elevated levels of PM2.5 linger, sometimes not returning to normal pre-game levels until the following morning. Populations who are sensitive to poor air quality would reduce their exposure by leaving before the game ends or staying in the stadium until the bulk of traffic subsides, Casper said. The study also identified isolated spikes in air pollution, in particular next to large charcoal grills. Fans can reduce exposure by avoiding close or downwind proximity to grills, especially charcoal grills that are associated with higher emissions than gas grills. “The closer you are to the source, the higher the exposure,” Frey said. 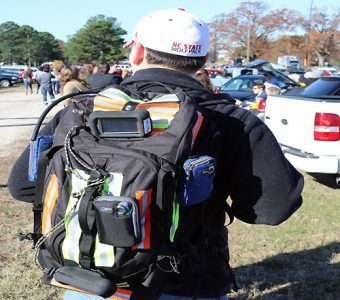 Before, during and after football games, a small team of researchers carried the mobile air monitor in a backpack equipped with GPS location devices. Video cameras collected visual data that allowed researchers to identify sources of any recorded increases in emissions. The mobile monitor also recorded spikes in air pollutants when next to old generators and large, idling vehicles. Air quality can be improved by upgrading to a newer model generator and turning off vehicle engines instead of idling, Bunds said. Funded by a grant from NC State’s Faculty Research and Professional Development program, the study is a pioneering look into pollutant exposure experienced by fans. This fall, stationary air monitors will be placed at a few tailgating sites to determine if and how long the spikes in air pollutants are sustained. Bunds and Casper, who study the impacts of large sporting and entertainment events, hope to replicate the study at additional stadiums.